Brett Baumeister, Western Ohio Market President for Mutual Federal talks about the newly opened branch in downtown Piqua on Wednesday. 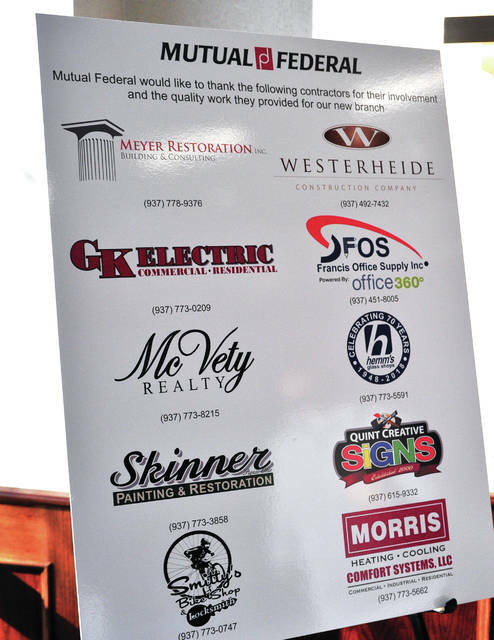 A sign in the lobby of the new downtown Piqua branch of Mutual Federal recognizes the many local companies that played a part in the bank’s renovation and opening. 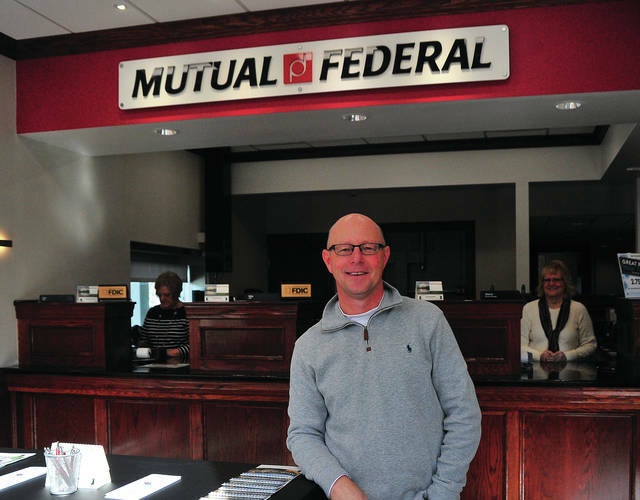 PIQUA — Mutual Federal recently expanded their locations in Piqua, opening a new location in downtown Piqua. 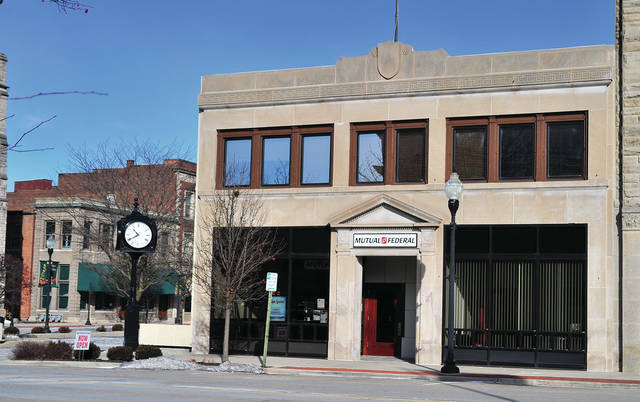 The new branch office is located at 126 W. High St., adjacent to the Fort Piqua Plaza on McCulloch Square. Brett Baumeister, market president of Western Ohio, Mutual Federal, said that adding an additional location in Piqua was a move that grew out of wanting to be supportive and involved in the community. The new branch offers a range of any bank product customers may need, including loans for cars, homes, and businesses in addition to other services that Mutual Federal offers, like deposit services and mobile and online banking applications. They also have an ATM onsite. “One of the advantages is that we have all of the technologies that the big banks (have),” Baumeister said. Baumeister said that what sets them apart from other banks is their people and their customer service. He added that their banks also have the authority and autonomy to approve loans worth a $1 million or more right now, which bankers at larger banks may not have the authority to do. Mutual Federal is also excited about their new location, getting closer to the community and the business district. “Our location is as good as it gets,” Baumeister said. They also have space to grow in their new building downtown. “We’re also growing our staff,” Baumeister said. In August, Mutual Federal named Sherrie Collett as the branch manager of the new downtown Piqua office. Collett has more than 29 years of banking experience in Piqua. Collett will be responsible for all branch operations, hiring staff, and leading Mutual Federal towards becoming the bank of choice in Piqua. Collett has resided in Piqua most of her life and welcomes her friends, relatives, and customers to stop by to see her when the new office opens later this year. Collett’s community service includes the Rehabilitation Center for Neurological Development and the Salvation Army Board of Directors. She looks forward to getting involved in additional Piqua non-profits and downtown initiatives once the downtown office is opened. Baumeister and other Mutual Federal employees have also shown their dedication to community involvement, participating in the Piqua Community Foundation board, the YMCA board, the iPiqua Fund, Mainstreet Piqua, Johnston Farm, and more. In 2016, Baumeister was the Piqua Area Chamber of Commerce’s Business Person of the Year for community involvement. Mutual Federal’s hours are 9 a.m. to 5 p.m. on Mondays through Thursdays, 9 a.m. to 6 p.m. on Fridays, and 9 a.m. to 1 p.m. on Saturdays. Other Mutual Federal locations include 138 N. Sunset Drive in Piqua, 2601 Michigan St., Sidney, 121 S. Ohio Ave., Sidney, and 1867 W. Main St., Troy. For more information about Mutual Federal, visit mutualbancorp.com.